Chinese art is built on a completely different view of the world from how it is approached by Western science. So it is not easy for Europeans to take in these different perspectives and to identify with them. Awareness of Chinese art and people who practice them, are gradually growing in the traditionally less spiritually based Western world. Feng Shui is the art used in China for several thousand years. Its aim is to harmonize the flow of energy in areas in which we live, and thus improve the atmosphere of a home, of relationships with others, to achieve greater inner satisfaction, wealth and to gain new energy to realize our wishes and dreams. A key area of feng shui is to achieve a balance of the opposing forces of yin and yang. Yin represents the feminine, passive, negative principle. Yin is earth, darkness, moon and death. Yang is the male principle, positive. Jang is heaven, light, sun and life. 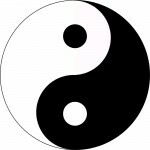 The world is in the Eastern concept the unity of these two principles; one cannot exist without the other, as evident from tajchi symbol. Two principles together form one unit and one is always contained in the other. Items in our interiors and gardens create and represent one or the other of two energy principles. The correct placement of objects representing the five elements (fire, water, wood, metal, earth) in eight areas of effort (for example, career, health, family, wealth and prosperity, marriage and relationships) can be achieved by harmonizing the flow of chi energy and the desired balance, harmony, contentment, and happiness can be so achieved. 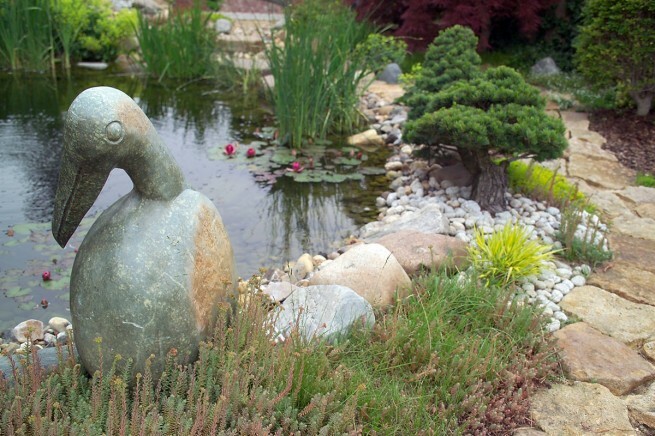 Stone sculptures represent the positive energy yang and it is possible to achieve proper balance and flow of energy by their appropriate location in the interior or garden. Experts in feng shui can change the placement of your furniture, use of colors and placement of statues and decorations in your home to help you in improving the overall quality of your life and personal happiness.